A scan of the original diagram Martin Newell drew up, to plan the Utah Teapot before inputing it digitally. For his work, Newell needed a simple mathematical model of a familiar object. His wife, Sandra Newell, suggested modelling their tea service since they were sitting down for tea at the time. He sketched the teapot free-hand using graph paper and a pencil. Following that, he went back to the computer laboratory and edited bézier control points on a Tektronix storage tube, again by hand. The teapot shape contained a number of elements that made it ideal for the graphics experiments of the time: it was round, contained saddle points, had a genus greater than zero because of the hole in the handle, could project a shadow on itself, and could be displayed accurately without a surface texture. Newell made the mathematical data that described the teapot's geometry (a set of three-dimensional coordinates) publicly available, and soon other researchers began to use the same data for their computer graphics experiments. These researchers needed something with roughly the same characteristics that Newell had, and using the teapot data meant they did not have to laboriously enter geometric data for some other object. Although technical progress has meant that the act of rendering the teapot is no longer the challenge it was in 1975, the teapot continued to be used as a reference object for increasingly advanced graphics techniques. Over the following decades, editions of computer graphics journals (such as the ACM SIGGRAPH's quarterly) regularly featured versions of the teapot: faceted or smooth-shaded, wireframe, bumpy, translucent, refractive, even leopard-skin and furry teapots were created. Having no surface to represent its base, the original teapot model was not intended to be seen from below. Later versions of the data set fixed this. The real teapot is ~33% taller (ratio 4:3) than the computer model. Jim Blinn stated that he scaled the model on the vertical axis during a demo in the lab to demonstrate that they could manipulate it. They preferred the appearance of this new version and decided to save the file out of that preference. The original, physical teapot was purchased from ZCMI (a department store in Salt Lake City) in 1974. It was donated to the Boston Computer Museum in 1984 where it was on display until 1990. It now resides in the ephemera collection at the Computer History Museum in Mountain View, California where it is catalogued as "Teapot used for Computer Graphics rendering" and bears the catalogue number X00398.1984. Versions of the teapot are still sold today by Friesland Porzellan in Germany, who were the original makers of the teapot as they were once part of the Melitta Group. 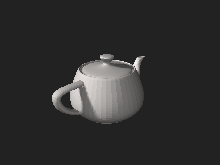 Versions of the teapot model — or sample scenes containing it — are distributed with or freely available for nearly every current rendering and modelling program and even many graphic APIs, including AutoCAD, Houdini, Lightwave 3D, MODO, POV-Ray, 3ds Max, and the OpenGL and Direct3D helper libraries. 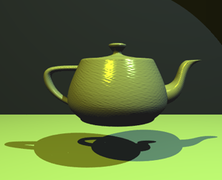 Some RenderMan-compliant renderers support the teapot as a built-in geometry by calling RiGeometry("teapot", RI_NULL). Along with the expected cubes and spheres, the GLUT library even provides the function glutSolidTeapot() as a graphics primitive, as does its Direct3D counterpart D3DX (D3DXCreateTeapot()). However version 11 of DirectX does not provide this functionality anymore. Mac OS X Tiger and Leopard also include the teapot as part of Quartz Composer; Leopard's teapot supports bump mapping. BeOS included a small demo of a rotating 3D teapot, intended to show off the platform's multimedia facilities. 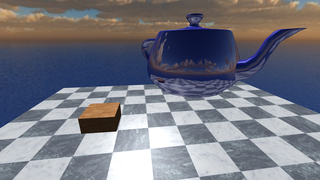 Teapot scenes are commonly used for renderer self-tests and benchmarks. One famous ray-traced image, by James Arvo and David Kirk in 1987, shows six stone columns, five of which are surmounted by the Platonic solids (tetrahedron, cube, octahedron, dodecahedron, icosahedron). The sixth column supports a teapot. The image is titled "The Six Platonic Solids", with Arvo and Kirk calling the teapot "the newly discovered Teapotahedron". This image appeared on the covers of several books and computer graphic journals. The Utah teapot sometimes appears in the "Pipes" screensaver shipped with Microsoft Windows, but only in versions prior to Windows XP, and has been included in the "polyhedra" XScreenSaver hack since 2008. Jim Blinn (in one of his "Project MATHEMATICS!" videos) proves an amusing (but trivial) version of the Pythagorean theorem: Construct a (2D) teapot on each side of a right triangle and the area of the teapot on the hypotenuse is equal to the sum of the areas of the teapots on the other two sides. Loren Carpenter's 1980 CGI film Vol Libre features the teapot, appearing briefly at the beginning and end of the film in the foreground with a fractal-rendered mountainscape behind it. Vulkan and OpenGL graphics APIs feature Utah teapot along with Stanford Dragon and Stanford Bunny on their badges. With the advent of the first computer generated short films and proceeding full-length feature films, it has become an in-joke to hide the Utah teapot in one of the film's scenes. For example, in the movie Toy Story, the Utah teapot appears in a short tea-party scene. The teapot also appears in The Simpsons episode "Treehouse of Horror VI" in which Homer discovers the "third dimension." It also appears in Pixar's Monsters, Inc. on the table in Boo's bedroom. In The Sims 2, a picture of the Utah teapot is one of the paintings available to buy in-game, titled "Handle and Spout". Through 3D printing, the Utah Teapot has come full circle from being a computer model based on an actual teapot to being an actual teapot based on the computer model. It is widely available in many renderings in different materials from small plastic knick-knacks to a fully functional ceramic teapot. It is sometimes intentionally rendered as a blocky, low poly object to celebrate its origin as a computer model. In 2009, a Belgian design studio, Unfold, 3D printed the Utah Teapot in ceramic with the objective of returning the iconographic teapot to its roots as a piece of functional dishware while showing its status as an icon of the digital world. In 2015, the California-based company and self-described "Make-Tank", Emerging Objects, followed suit, but this time printed the teapot, along with teacups and teaspoons, out of actual tea. The original teapot the Utah teapot was based on is still available from Friesland Porzellan. Originally it was plainly called "Haushaltsteekanne" (Household Teapot); the company only found out about their product's 'fame' in 2017, whereupon they officially renamed it "Utah Teapot". It is available in three different sizes, the one Martin Newell had used is the "1,4L Utah Teapot". ^ Dunietz, Jesse (February 29, 2016). "The Most Important Object In Computer Graphics History Is This Teapot". Nautilus. Retrieved March 3, 2019. ^ Mark Kilgard (Feb 23, 1996). "11.9 glutSolidTeapot, glutWireTeapot". www.opengl.org. Retrieved October 7, 2011. ^ Torrence, Ann (2006). "Martin Newell's original teapot". ACM SIGGRAPH 2006 Teapot. p. 29. doi:10.1145/1180098.1180128. ISBN 978-1-59593-364-5. Article No. 29. ^ "The Utah Teapot - CHM Revolution". Computer History Museum. Retrieved 20 March 2016. ^ Seymour, Mike (2012-07-25). "Founders Series: Industry Legend Jim Blinn". fxguide.com. Archived from the original on 2012-07-29. Retrieved 15 April 2015. ^ "Original Utah Teapot at the Computer History Museum". The Computer History Museum. 2001-09-28. Archived from the original on 2012-08-20. ^ a b "Teekanne 1,4l Weiß Utah Teapot" (in German). Friesland Versand GmbH. Retrieved May 5, 2018. ^ a b Friesland Porzellan [@FrieslandPorzel] (2017-03-24). "The original Utah Teapot was always produced by Friesland. We were part of the Melitta Group once, thats right. Got yours already?" (Tweet) – via Twitter. ^ Wald, Ingo; Benthin, Carsten; Slusallek, Philipp (2002). "A Simple and Practical Method for Interactive Ray Tracing of Dynamic Scenes" (PDF). Technical Report, Computer Graphics Group. Saarland University. Archived from the original (PDF) on 2012-03-23. ^ Klimaszewski, K.; Sederberg, T.W. (1997). "Faster ray tracing using adaptive grids". IEEE Computer Graphics and Applications. 17 (1): 42–51. doi:10.1109/38.576857. ^ a b Arvo, James; Kirk, David (1987). "Fast ray tracing by ray classification". SIGGRAPH. 21 (4): 55–64. doi:10.1145/37402.37409. ^ Carlson, Wayne (2007). "A Critical History of Computer Graphics and Animation". OSU.edu. Archived from the original on 2012-02-12. Retrieved 15 April 2015. ^ "Windows NT Easter Egg – Pipes Screensaver". The Easter Egg Archive. Retrieved May 5, 2018. ^ NASA (1988). "Project Mathematica: Theorem Of Pythagoras". archive.org. 14:00. Retrieved 28 July 2015. ^ "Vulkan Overview - The Khronos Group Inc". archive.org. ^ "Tempest in a Teapot". Continuum Magazine. Winter 2006–2007. Archived from the original on 2014-07-12. ^ Groening, Matt. "Pacific Data Images on Homer3". Archived from the original on 2000-10-18. ^ "Utanalog, Ceramic Utah Teapot". Unfold. October 28, 2009. Retrieved 12 May 2015. ^ "The Utah Tea Set". Emerging Objects. Retrieved 12 May 2015. ^ "Eine Teekanne als Filmstar" (in German). Radio Bremen. Retrieved March 1, 2019. 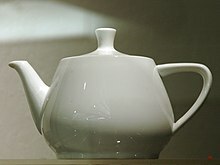 Wikimedia Commons has media related to Utah teapot.